One of the most amusing things to happen in Nigeria recently, certainly for me, is the whole furore over British Airways which began with landing slots but has now graduated into a cry over unfair ticket prices. Suffice to say that Nigeria is rather angry over what remains unclear hence the sabre rattling. The latest line is that British Airways in particular, charges Nigerians ‘unfair’ prices especially when compared with neighbouring Ghana. What is most bizarre about the comparisons being made is that they focus on Business and 1st Class tickets. Why on earth will a government claiming to fight unfair ticket prices be concerned about premium tickets? A 1st class ticket is a luxury good meaning that the producer has no incentive to lower the price except when demand is low i.e. when demand is high for such goods, the logical thing to do is to increase its price because people who demand such goods are not price sensitive. Afterall, you are going to enter a plane and pay $6000 for a flight where someone else sitting within a few metres from you is paying $1000, it has to be that money aint a thing for you. Also importantly, the more an airline can get those who buy premium tickets to pay, the less it can afford to charge those in economy (the vast majority) i.e. the premium passengers more or less subsidise the economy fliers. So what is wrong with this? What is the government’s business with the price rich people choose to pay for a 6 hour flight? More to the point, are Nigerians really discriminated against when it comes to ticket pricing? The best way to answer this is to, as always, compare with other countries in the world. First thing to understand is the nature of our demand as a people. Any casual observer will easily see that, the busiest period on the London to Lagos route is during the festive season in December. Nigerians love to travel during this period and will seemingly pay over the odds just to be in Lagos for Christmas. Shrugs. Now when you have so much demand for something concentrated over a certain period, economics (or greed if you prefer) will always take over. It makes economic sense for the supplier of the product to cash in as much as possible over that period and then reduce prices afterwards when demand falls. In this regard, British Airways and the Ram sellers are no different. We all know how ram prices in Nigeria shoot up astronomically in the lead up to sallah, only to crash back down to earth the day after the celebration. Same ram, different prices. Economics. Are there any other countries where the nationals have concentrated demand for air tickets over a given period like we do? The answer is yes. Let’s check out 3 of them. Unfortunately it is very difficult to find historic ticket prices so we will use forward looking prices. When do Indians like to travel? We can easily guess that its during the Diwali festival. There’s also a huge Indian contingent in London that greatly outnumbers Nigerians. Next year’s Diwali festival will be on Tuesday November 13th. So let’s imagine you are an Indian in London and you want to travel from Heathrow to Mumbai for 2 weeks. You want to leave London on the 6th of November 2012 to return on the 20th of November. The price to go home for Diwali, even when you are booking 1 year in advance with Air India for that matter is an astonishing £3006 for an economy ticket lasting 8hrs. Same ticket and airline, this time the price is £492 for an economy fare. Unfair? 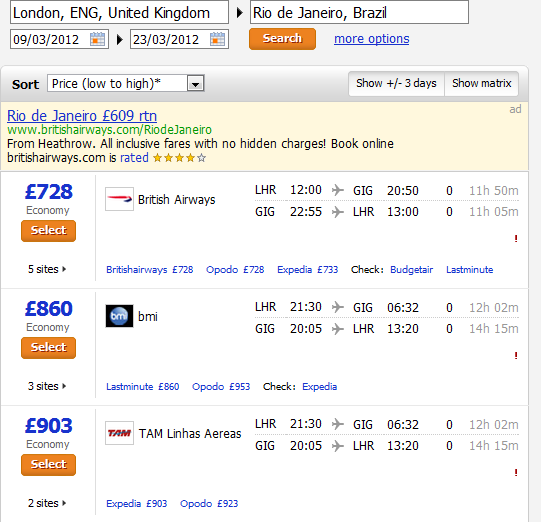 In this case, the British Airline (although currently German owned) BMI charges much lower prices than TAM the Brazilian carrier. 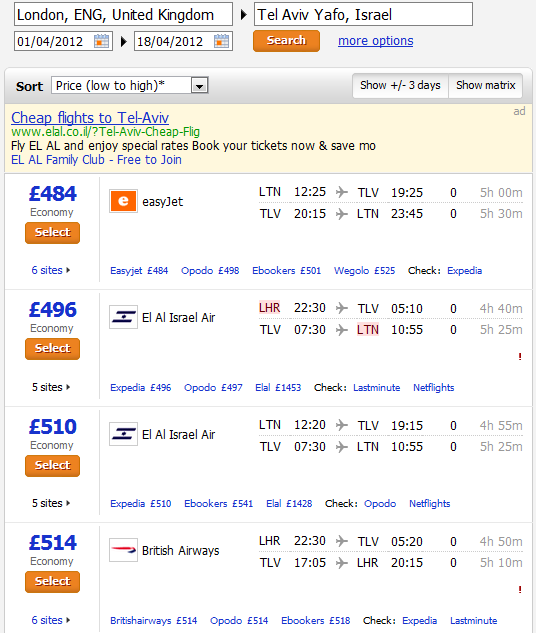 Prices going up to almost £4k for an economy ticket for a 15hr direct journey. What if we decide to travel in March after the Rio festival is definitely over. Let’s leave London on the 9th of March and return 2 weeks later. Oops, same ticket can now be obtained for at least £300 cheaper. Even TAM has dropped it prices drastically. Unfair eh? We musnt forget the Jews. I live in North London and there is a Jewish Synagogue right next door to me so I have a very good idea of how plentiful the Jews are in London. The Jews, as I understand like to return home during Passover. Next year’s Passover falls between April 6th – 14th. 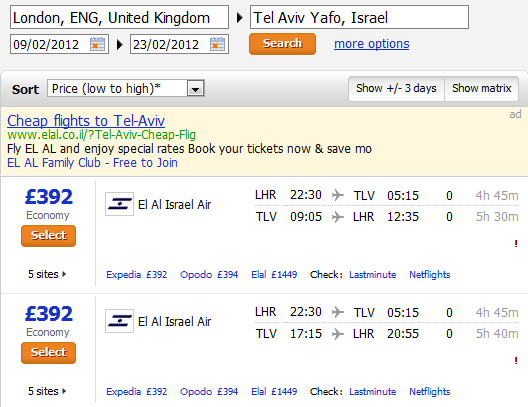 Again, let us depart London to Tel Aviv on April 1st and return on say the 18th. Prices range from £484 to £514. Bear in mind that this is barely a 4 hour flight. And what happens if we decide to travel in February for 2 weeks (9th to 23rd) well before the Passover? In this case, the reduction isnt that much but the point here is that it costs less to travel sooner which goes against the whole idea of booking early to save money. You are probably getting bored now so let’s finish up with Nigeria by leaving London on the 18th of December to return on the 3rd of January. As usual, maga must to pay. 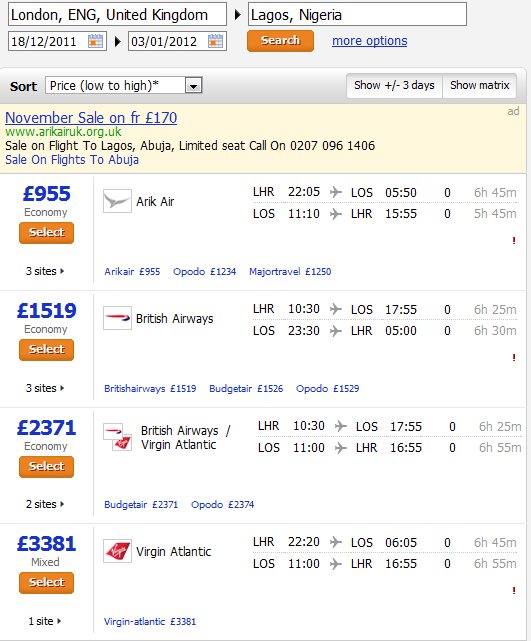 You can fly Arik at £955 or go with BA for £1519. Virgin Atlantic doesnt even come up which probably means, they are fully booked for that period. And what if you leave London randomly again in February (9th – 23rd). As expected, prices have dropped in line with demand and VA now pops up on the list as available. The point of all of the above is to establish that there is nothing about the pricing policy of airlines who fly to Nigeria that is strange or unique to Nigerians. But of course, if you are a government minister in Nigeria, it is a nice populist argument to make it look like the nasty British are ‘exploiting’ Nigerians so let’s use our favourite government weapon, ban them! But there is in fact one more problem that is worth addressing. Tickets to Nigeria even during the off season are more expensive than flying to other countries even with longer journeys. And why is this so? The simple answer is that the competition on the London to Lagos route is not deep enough to force down the prices. It is therefore to be expected that prices on a route with 6 carriers cometing fiercely with each other will be cheaper than on a route with only 3 carriers. I dare say that if not for the Christmas demand, tickets to Nigeria should be much more expensive than they currently are. The above is why it is very silly to compare ticket prices between Nigeria and the USA based on journey times without taking account of competition. 1. The first one is fairly obvious – get a second Nigerian airline to compete on that route and bring down prices. For this airline to be able to do this, it needs to be extremely well funded and be ready to be loss making for 5 years at least. Off the top of my head, I imagine you will need $1bn at least to make this happen. Those who have successfully done this are airlines like Emirates in the past and now Qatar Airways and Etihad. Not to forget that you will need to back the airlines with cheap fuel like the Arabs do. The airline business is said to be the fastest way for a billionaire to become a millionaire as it can be deeply unprofitable. This article gives an idea of the kind of challenges that Kingfisher is currently facing in India. But does this make sense? Why should Nigeria which is facing serious infrastructural among myriad other problems back home spend money on an airline to carry at most 3000 already priviledged Nigerians between Lagos and London every week? My opinion is that there are far better things we can spend money on. 2. In 2008, the EU and USA began a new open skies agreement. Nothing new about an open skies agreement but the novel thing about this agreement is that it treated the whole of Europe as one and the USA as one. What this means in practice is that an Air France plane can take off from London Heathrow to Los Angeles without having to stopover in Charles De Gaulle in France i.e a direct flight from an airport that is not in its home country. 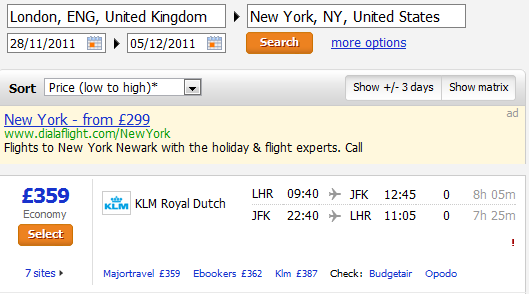 You can fly from London to New York non stop on a Dutch airline without the need to stop in Amsterdam. The reason for this of course has to do with the fact that Heathrow is by far the busiest airport in Europe. So how does this affect Nigeria? Well all these problems have arisen from the BASA we have signed with Britain in particular. But what if someone in our Aviation Ministry was smart enough to negotiate an open skies agreement with the EU as a whole and not just Britain? The UK is of course subject to EU law and thus any agreement we have with the EU will supercede whatever we have with the British. You probably get where I am going with this now. If we have a similar agreement with the EU as a whole, we can increase competition on the Lagos to London route without even spending money. This will mean that airlines like KLM and Lufthansa can fly direct from Heathrow to Lagos without the need to stop over in Amsterdam or Frankfurt thus increasing the number of direct options available to Nigerians on that route, just like the Indians have. Airlines are of course rational and want to make money, so if they see that the demand by Nigerians is for direct flights from Heathrow to Lagos especially during Christmas and British Airways and Virgin are printing money on the route, they are bound to want to cash in by offering the same service…which is bound to bring prices down. The lack of an understanding of basic economics by those in Nigerian government is depressing to say the least. How a minister can think she can force down prices by a directive without unintended consequences is amusing to say the least. What if airlines start charging Nigerians for a 2nd bag like everyone does on journeys from London to the USA? Knowing how we like to travel like the world is coming to an end, will the Minister prefer this option? The problem of course with my 2nd solution above is that it will involve a lot of hard work and putting forward the best and sharpest Nigerians to negotiate for us to achieve it. Why bother with that when you can do the usual gra gra and get those who dont really understand the economics to cheer you on as the defender of Nigeria against British interests? 2. I havent bothered comparing prices from Nigeria with Ghana because the ‘regional imbalance’ argument is the most idiotic one I have heard in a long time. 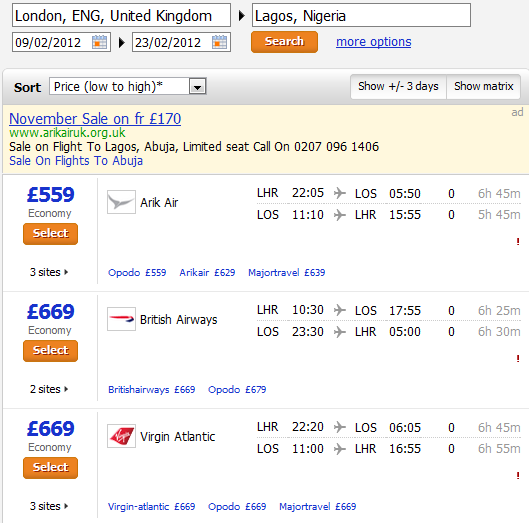 It is cheaper to fly from Nigeria to London on economy than from Accrabut more expensive to fly premium or 1st class. Go figure. Feyi, nice write up. U ve X-ray the issue appropriately and you have done more than academic/professional job. I would have mistaken u for an aviation personnel. However, on the issue of Open sky agreement btw Nigeria and EU states, professionally, its not a viable option for any African country for now. The AU has drafted a similar BASA template for AU countries but due to the economic disadvantage nature of the EU open sky agreement template, its yet to be in use. The Open sky by EU is slightly difficult than presented but on the long run we may end up not to have a choice in Africa. We currently have same challenge with the US who maintain an Open sky agreement world wide. Without proper interlining agreement/ good code share agreement, we can’t make it. Oga Feyi, this is just perfect..
You have done the strategic thinking for the minster and her staff. We just need someone to forward this article to them.. I am beginning to change my mind about the major problem of Nigeria; it is no more ‘a lack of good leaders’, it is now a ‘lack of good adviser and competent support staff’. Nice one, Feyi sans the insulting words, of course. Awesome post Feyi, thoroughly researched and backed up with incontrovertible evidence. I wish we can publish this in one of our dailies. When government belongs to career politicians and the blogosphere belongs to technocrats,the result is Nigeria. Please use your man-knows-man to enter government soon o…as long as we can avoid the Abati syndrome. In my opinion, outside of demand the biggest reason for the fare difference between Nigeria and Ghana is related to cost. Aviation fuel is cheaper in Ghana, so is hotel bill for the crew. They have better and affordable infrastructure at their airports….i could go on!